A Look at the Peter Flynn-Helmed Into the Woods in D.C. Check out photos and video here. "...director Peter Flynn handles the material in "Curvy Widow" with light-hearted elegance and excellent pacing." "As directed by Peter Flynn (Theatre Row's Two Rooms), Curvy Widow...sings and frolics, filling the stage with a playful spark and a 'let's put on a show' demeanor." "Kudos to Goldman...for enlisting Director Peter Flynn to guide with a playful and sensitive touch." "Ms. Goldman has wisely put her play in the resourceful hands of director Peter Flynn, who extracts from it al the humor, some of it bringing belly laughs." "Under the guidance of director Peter Flynn...the result is a snappy, breathless and sophisticated romp." North Carolina Stage Company, Asheville. "'The Curvy Widow' at Asheville's NC Stage Co."
To read the full Citizens Times review, click here. "Curvy Widow at N.C. Stage"
To read the full Mountain X review, click here. "Nancy Opel Will Head Cast of New Musical Curvy Widow"
To read the full Playbill review, click here. "Trish Santini, Peter Flynn and Frank Butler announced today the formation of their new company Mainspring Arts Cooperative (MAC), a not-for-profit organization that will produce and present productions that can tour regional theaters nationwide." "Peter Flynn's direction is bursting with energy and movement." "You will want to see and hear Ms. Burns. She captures the nuances and playfulness of the Judy Holliday from her too-short stage and film career. She also projects the sad truth and impossible situation of a world that refused to accept a woman as the smartest person in the room." "Jonathan Brody and Adam Heller, a protean duo, play all the people in Holliday's life, and Andréa Burns brings an enormous amount of charm, humor and intelligence to the title role." Check out photos and a video here. "Ford’s decision to stage Ragtime this year felt eerily timely given the political climate. Peter Flynn’s production had a high-stakes intensity to it, and that energy seemed to trickle down to every member of the show’s robust cast." "The production of Ragtime showed us that no, theatre, even musical theatre could be a true weapon of resistance and an opportunity to carry a banner in the battle for the true character of American society, one enriched by the many people who came to our shows and reshaped it for the better...the production did it all not only with intelligence but passion and a boatload of supreme local talent. In fact, the entire cast seemed to have been charged with the kind of adrenalin that comes from a personal commitment to putting one’s voice and soul in the service of a larger idea." 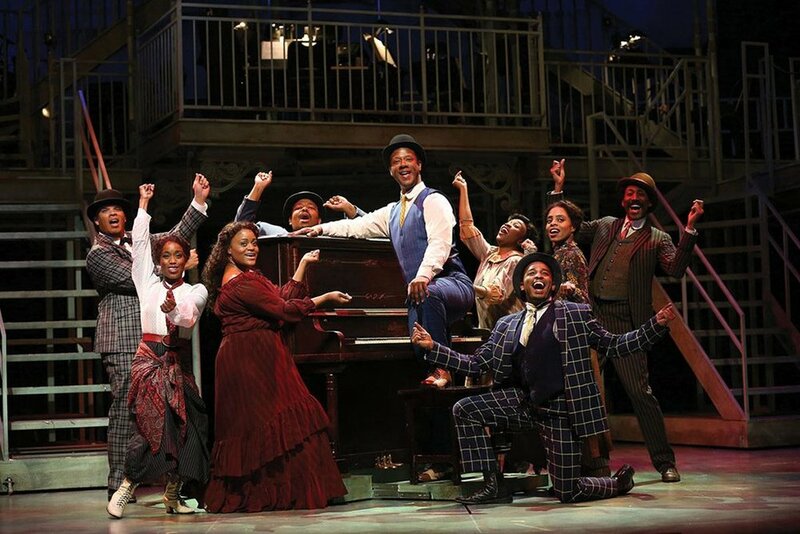 "Ragtime sings with purpose at Ford's Theatre...the new production stirringly delivers on the kaleidoscopic show's cries for justice." "Peter Flynn's production utilizes the full volume of the large Ford's stage to capture the immensity of the show and its themes"
"Ragtime is under the very capable hands of Director Peter Flynn"
"Glorious! Dazzling! Verve! Bursting at the seams with voices and stories of America's humanity and originating dreams." "Under Peter Flynn's lucid direction Ragtime is full of heart and optimism, sorrow and anger, with humor dished out as well, that is stunningly sung and deeply conveyed by a remarkable cast." "Director Peter Flynn's vision for Ragtime is a joy of emphasized humanity delivered by golden voices who lived and breathed their songs and each and every lyric." "Director Peter Flynn has made the complicated and layered story crystal clear and has helped the characters to be differentiated." "Every scene is so fleshed out and truthful." "Directed with obvious affection by Peter Flynn, the production is calculated to stir the soul of every lover of the American story, without regard to which lever you pull on Election Day." "Flynn reveals a talent for eliciting nimble portrayals. You can see how “1776” might tilt toward over-animated broadness. But here, Bloch’s Franklin, for instance, never slides into cuteness, nor does Ashmanskas’s Adams become a Broadway caricature of prickliness. These disciplined treatments reach a natural emotional climax at the evening’s end, when all these men of clashing styles and interests convene movingly for the defiant act that’s stored in the minds of American sixth-graders of all ages." "Peter Flynn is to be commended for bringing historical drama to such detailed life"
To read the full Washington Post 1776 review click here. "A classic intersection of Shakespeare and Broadway, with a high-energy, strong-voiced company set in farce mode by director Peter Flynn." "Under Peter Flynn’s proficient direction, the ensemble cast shines throughout, most portraying several characters. Justin Moran’s characters could easily become cartoonish but they do not. They are authentic characters with real conflicts that through humor and charm can be identified by audience members. Hopefully, "Pope: An Epic Musical" will be seen again in the near future on another stage." Check out photos here and a video here. "Theatre Works' free summer show Junie B. 's Essential Survival Guide has so many things going for it." "El Toro Fabuloso-- all the numbers were fun, but this one transcended the genre of kid musical to artistic truth"
"Take all your New York kids to see this show, and tell the ones you meet to grab a seat." "The director, Peter Flynn, has gotten charming performances from the company"
"A full house of grade schoolers...were fairly rapt all the way through...This is the best evidence I can think of that Theatreworks is doing something right"
"Peter Flynn's directorial hand is firm and expansive as we see mainly in the wonderful performances of Albert Jones and Bianca Laverne Jones"
To read the full The Mountaintop review click here. "Smartly directed by Peter Flynn, JUNIE B. JONES offers enough humor to tickle even adults! John Scherer brings the house down!" "Whether pining for the good old days of kindergarten, navigating the grade-school social scene or experiencing her first crush, JONES charms her peers in the audience as well as their parents. The six-person cast is top-notch. Jennifer Cody is a riot!" "Better than the first time around!The roars from the patrons -- children and adults -- speak for themselves!" "A bright, entertaining mini-musical with cute, jaunty choreography and melodic, genre-spinning songs. Any 5-year-old ought to be proudto call this his first musical!" "With JUNIE B. JONES, Theatreworks USA continues to prove why it is such a vital presence forNew York's theatre scene. By providing intelligent, well-written and affordable theatre that entire families (not only children) can enjoy, they guarantee a future for every other theatre in the city!"